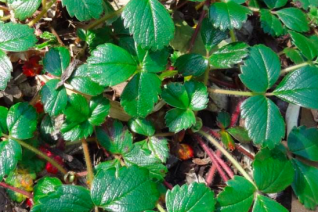 Pacific coastal strawberry is a beach native- in fact it occurs all around the Pacific Rim and makes an adorable and durable ground cover on sand dunes. Well this version is like the giant hulk of strawberries. Huge in every way and vigorous? Wow, plant and get out of the way. The large glossy evergreen leaves are up to 6″ across and the single white flowers in spring and summer (sometimes in winter) are large also. The paltry fruit that follows is far from edible. It won’t kill you but you really have to like sour and gritty with millions of seeds. This is an ideal ground cover for rough sites in full sun to part shade. Don’t bother enriching the soil that will just make this trailing monster roar. Instead err on the side of a little neglect and watch what this native plant can do. Be wary of delicate plants in the vicinity. Evergreen, easy and drought tolerant. Oregon native plant. Excellent strain of the delicious woodland strawberry. 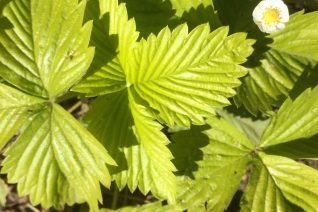 Forms clumping plants to 1′ x 1′ and a continuous parade of small white flowers means that the season of harvest of the small but sweet berries is equally as long. Line paths in a woodland or just stick one where ever so that when you get hot and hungry in the garden you have snack at arms length. Really easy to grow hardy perennial. Burns in full hot sites, happier with protection from blasting rays and dry soil. Rich soil with regular water leads to results. Semi-deciduous in winter. Not bothered by pests. Well, maybe dogs, Dogs will sneak some berries when you aren’t looking. I love dogs. Oregon native plant. Haute edible gardening meet haute ornamental gardening. 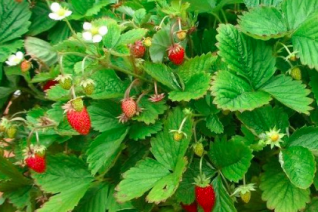 This cheerful and bright woodland strawberry sets shade alight and continuous small white flowers turn into tasty red berries all summer long. Pair in part shade with Hakenochloa macro ‘All Gold’ Japanese forest grass for a great color echo and contrast in leaf shapes. To 6″ tall and maintaining a clump in part shade and rich, moisture retentive soil. May self sow and gold seedlings are easy to spot and move or give away. Such a good idea for many reasons.